April 29, 2013  Thousands of cars were damaged or destroyed by Superstorm Sandy. Others were simply left unclaimed. Now six months after the storm, the car market is beginning to stabilize. April 25, 2013  The founders of financially troubled Fisker Automotive were grilled by Republican lawmakers on Capitol Hill Wednesday. The electric car maker received a $529 million loan from the Department of Energy in 2009. The carmaker is now on the edge of collapse. Fisker has laid off most of its employees and hired bankruptcy advisers. April 22, 2013  Doctors get asked medical questions at dinner parties, and lawyers are probed with legal questions. Car analysts, testers, and reporters also get asked about cars — but there are dangers to giving car advice. April 19, 2013  With ad sales soaring, Google posted a 16 percent increase in first quarter profits. Google earned more than $3.3 billion during the quarter. Another big player in the technology sector, Microsoft also posted positive earnings. April 11, 2013  Toyota, Honda, Nissan and Mazda simultaneously announced a global recall of nearly 3.4 million vehicles to replace defective air bags. The faulty air bags could deploy with excessive force and send shards of metal into the passenger side area. Coordinated recalls are unusual in the auto industry. April 10, 2013  The Focus is the best-selling "nameplate" worldwide, followed by the Toyota Corolla, new data shows. Ford's sales have jumped in recent years as it dropped unsuccessful models and adopted a single global manufacturing system. April 5, 2013  California's economy is a study in contrasts. The state's unemployment rate — 9.8 percent — is tied with Rhode Island for the highest in the country. Parts of the state are still suffering mightily from the housing collapse. But there are also large pockets of job growth and revival. April 3, 2013  Toyota, Honda and other Japanese automakers are doing just fine in the U.S. Sales have rebounded, buoyed by a weaker yen and the usual lineup of reliable cars. In the home market of Japan, however, the car makers are struggling. April 1, 2013  Two startup automakers with big ambitions for electric vehicles appear to be headed in different directions. Luxury plug-in hybrid maker Fisker has hired a law firm to advise it on a possible bankruptcy, according to multiple published reports. Electric car maker Tesla announced on Monday that it expects to turn its first ever profit in the first quarter. March 30, 2013  The Environment Protection Agency has proposed new rules that will require cars to run on cleaner gas. The rules are intended to lower sulfur emission and reduce smog, and they'd go into effect in 2017. NPR's Sonari Glinton reports they're similar to standards in place in California. March 28, 2013  A report by analysts at Citigroup says a shift from oil to natural gas that began in the United States is about to follow suit in other countries. The report says gas may supplant oil for generating electricity in the developing world and will also become more commonly used for transportation. March 26, 2013  Ford has said it is sorry for print ads depicting three bound and gagged women stuffed in the trunk of an Indian-made compact car. The ads, created by an Indian agency, were never distributed commercially, and were apparently not intended for release. Which Helps The Economy More: A Rebound In Stocks Or Housing? March 25, 2013  Both housing and the stock market have been on the upswing in recent months. But a full recovery in the housing market would be more significant to the overall economy. That's because more Americans have something at stake in home values than in stock prices. March 19, 2013  Federal prosecutors have indicted the former CEO of the California Public Employees' Retirement System and a former fund board member on fraud charges. The two deny the charges, which culminate a federal investigation into alleged corruption by the two men. March 14, 2013  After more than 100 years of ups and downs, General Motors has a lot of history. Most of GM's history is in the form of cars — hundreds of actual individual cars. The company tries to keep at least two of each car in storage. 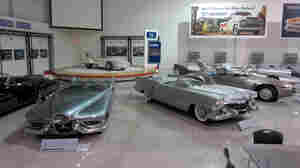 NPR's Sonari Glinton went on a walk through GM's attic to find out about the company's past and future.